We have already dedicated some blog posts to the do-it-yourself trend in e-learning. Of course, it is important that no obstacles will be put in the course creator’s way, no matter whether they are working alone or in a team – otherwise the whole training project faces failure. Simple and self-explanatory software is thus an important basis. And that is exactly what we at Coursepath value and aim for. Our current update involves some improvements for editing courses, which we will present here in greater detail. If you are assigned the author role in a course, you will now automatically see its table of contents in the new edit mode. Buttons to add new learning steps or modules are directly visible without the need to switch to edit mode beforehand. Further editing options can now be found via the three small points, which will directly lead you to module settings or editing of the step. As usual, visibility and display within the table of contents can also be set here directly. 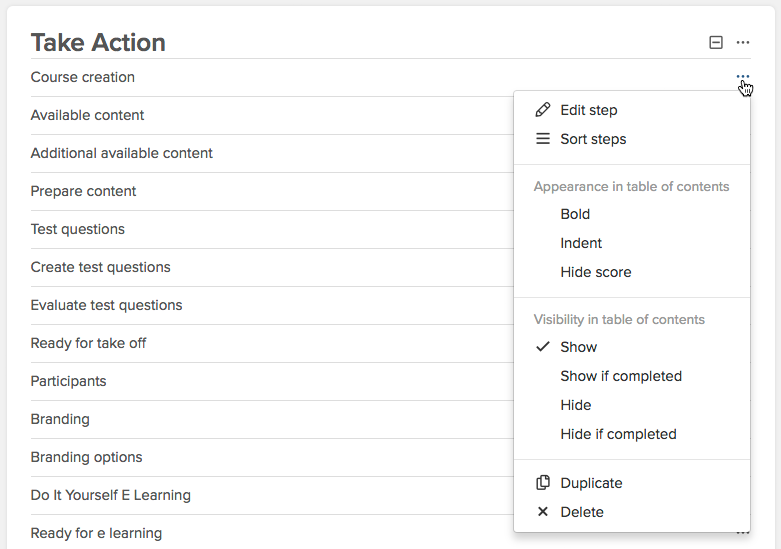 With the new editing mode, you can now sort modules and steps in a separate area rather than within the table of contents. The same applies to renaming of modules and learning steps. In the table of contents, the simplified editing mode improves clarity. Further options for learning steps can now be reached with fewer clicks (via the three points, see above). This slightly different setup allows for the “More options” section within the learning step itself to be leaner. Duplicates are omitted this way. By the way, Coursepath also comes with a new look: new icons and a cleaner design are adding to Coursepath’s fresh layout. With an easy-to-go platform, there is nothing standing in the way of creating your e-learning courses yourself. Software that is easy to use allows for you to create and edit learning content straightforward. 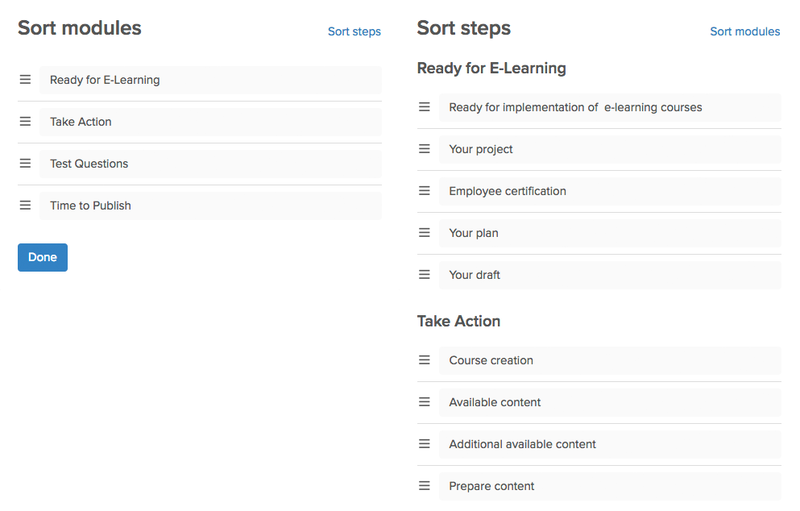 This way, you can efficiently implement your e-learning project yourself.